Cheap Astronomy’s own Sky Station 1, possibly the cheapest department store telescope in the southern hemisphere, is a fine example of the genre. Bought on special from a well known Australian electronics chain, it cost just under $130. The 115mm (or ‘4 inch’) main mirror is probably as low as you would want to go, but is totally adequate to visualise Saturn’s rings—and other astronomical marvels. 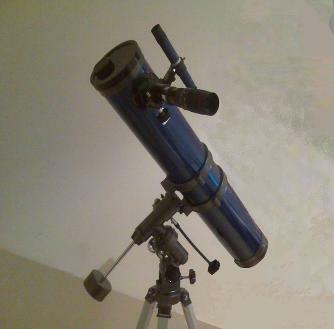 Cheap Astronomy has had less experience with refractor telescopes. Anecdotally, these scopes are less likely to deliver good results at the cheap end of the market as their functionality relies much more on consistent lens quality. If you decide you want to spend any extra cash, this is the area of wisest investment. Standard ‘Plossl’ lenses used in reflector scopes are affordable and interchangeable, meaning one good purchase could upgrade generations of cheap telescopes. After an intensive period of consultation and evaluation, Sky Station 1 was upgraded in 2008 by purchase of an 8-24mm zoom lens, at a cost of approximately $80. At more than half the original value of the base telescope, this upgrade replaced an original set of adequate lenses with a single eyepiece of somewhat better quality. More importantly, a zoom lens has the benefit of being able to enhance magnification without the tiresome swapping of lenses. 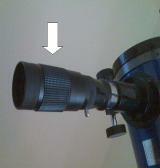 On a cheap telescope, swapping from a low to high magnification lens often results in the scope being nudged out of position due to failure of the cheap equatorial mount. Cursing and wailing ensues. With a zoom lens, you are able to continue visualising the object of interest throughout the course of magnification. Such zoom lenses are not easily obtained in department stores, but may be found, for example, on popular on-line auction sites. If contemplating this approach, you should first check your scope’s lens adaptor size (1.25 inch is generally standard—or there are 2 inch sizes around also). There is a common anecdote in the home astronomy community that adding weight to a cheap equatorial mount will help stabilise it. After exhaustive tests using different configurations of weights, Cheap Astronomy is skeptical that this delivers any significant benefit—and even if there is, it is unlikely to be worth the additional effort in setting up your scope for an evening of casual viewing. Another suggestion is dumping the cheap mount completely in favour of a traditional camera tripod. A quick assessment of Sky Station 1 indicated that it could not be attached to a standard camera mount without some messy jury-rigging. Nor was Cheap Astronomy able to identify an off-the-shelf adaptor that could be guaranteed to join a telescope to a camera tripod without risking good money on an experimental purchase. With the effort-benefit equation already tipping, further testing of this approach was abandoned. This approach assumes most households will have (for example) a telescopic rifle sight lying around or some old binoculars that no-one will mind you sawing in half. Apart from the implausibility, and the unreasonable effort-benefit equation involved, these solutions still fail to address the real problem of cheap finder scopes. As a magnifying tool, they do the job, the problem is how to accurately line them up with an object to be viewed through the main scope. Cheap Astronomy is yet to manage to exactly align Sky Station 1’s finder scope using the standard 3x thumb-screw mechanism—but at least it gets close. The rifle sight and hemi-binocular proponents do not explain how their solutions can be adjusted with even this level of accuracy. The same non-adjustability problem exists with the idea of duct-taping a green light laser to your scope—and they are illegal in most places anyway. Don’t do this. One cheap intervention that has improved the operation of Sky Station 1 is the wrapping of a few layers of masking tape around the finder scope tube, where the thumbscrews make contact. This gives the screws a softer surface to ‘dig into’. While this has done nothing to improve the pointing accuracy of the finder scope, it does help to keep it locked in place when the telescope is being moved around.